I can honestly say that I can’t pick out very many of our cows by sight without seeing their ear tag. Not so with 1950! If a group of cows is in the head locks and you look down their backs, most of them are with in a couple of inches. This cow stands way taller than all the others! She is probably 5’8″ to her back bone. So she stands out anywhere she is, and I always recognize her as 1950 right away! My dad and I ended up assisting a cow with a calving today. No big deal, just an easy pull by hand. You can see the chain that we used to pull the calf on its right leg. We put one on each leg, but the left one had fallen off before I took the picture. 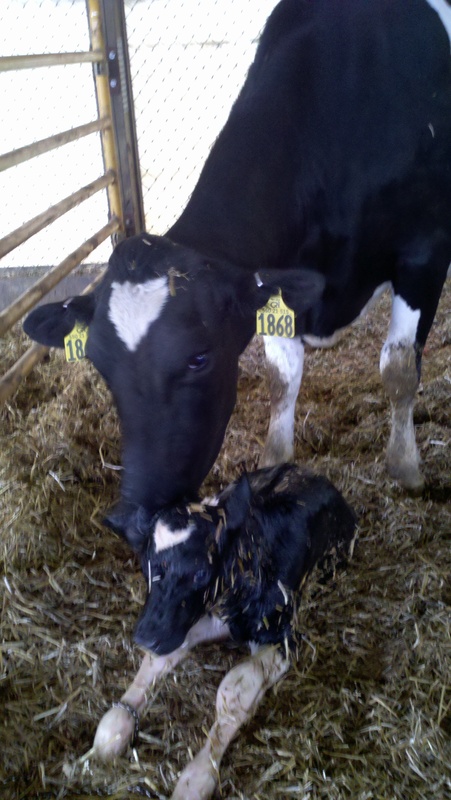 The calf is all ready struggling to get up only minutes after being born as mama licks him off!